An Amtrak Acela train passes through the Princeton Junction station in West Windsor, N.J.
Six weeks ago, I warned that President Obama's much maligned high-speed-rail program was becoming a " high-stakes gamble." Well, the President just went all in. On Tuesday, Vice President Joe Biden announced a six-year, $53 billion plan to expand high-speed passenger trains, a surprisingly aggressive boost for Obama's fledgling effort to change the way we move around the country. Last year, the President requested just $1 billion for the program from a Democratic Congress; now that Republicans control the House and have vowed to slash spending in general and high-speed rail in particular, he's requesting $8 billion for next year. Judging from the reaction of the House Transportation and Infrastructure Committee chairman, John Mica, who is actually one of the more supportive Republicans when it comes to rail, Obama shouldn't count his winnings yet. "This is like giving Bernie Madoff another chance at handling your investment portfolio," Mica said. Still, the announcement at Philadelphia's 30th Street Amtrak station  a key link in the popular and profitable Acela line, which is America's closest current approximation of a bullet-train service  made it clear that Obama intends to fight for one of his signature initiatives even though it's had a run of bad press. He announced in his State of the Union address that he wants high-speed rail to serve 80% of the population by 2025, as part of his new push for infrastructure investments to promote American competitiveness and help "win the future." But now he's really putting his money  or at least his budget proposal  behind the program. 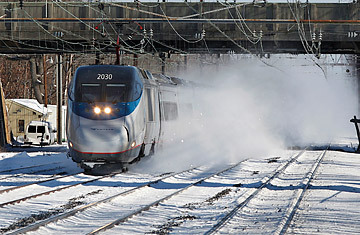 Biden, who has ridden Amtrak nearly 8,000 times between Washington and Wilmington, Del., predicted that a national network of faster trains would help create jobs, reduce dependence on foreign oil and relieve congestion in highways and airports, while upgrading the long-term efficiency and productivity of the U.S. economy. Just one day after Amtrak announced it was resurrecting a recently killed commuter-rail tunnel to send more Acela trains into Manhattan, Biden said the Administration was proposing the largest rail investment since Abraham Lincoln began the intercontinental railroad  and promised a similar impact. "If we don't seize this future, how will America ever have the opportunity to lead the world in the 21st century?" Biden asked. In 2009, Obama launched high-speed rail by slipping $8 billion into his stimulus package, even though few potential projects were shovel-ready enough to provide real stimulus. Eager governors from both parties made $55 billion worth of requests for the cash, a reflection of pent-up demand, and in last year's State of the Union, Obama described the program as a matter of not just mobility but also of national pride as well. U.S. passenger trains are, quite simply, a global laughingstock. Most of them travel at speeds that were common a century ago. Meanwhile, bullet trains have been zipping around Western Europe and East Asia for years, China is building more high-speed rail than the rest of the world combined, and even countries like Morocco and Brazil are getting into the game. "It works everywhere else in the world," says Alstom Transport vice president Chuck Wochele, whose French firm is one of 30 train manufacturers that have pledged to build or expand U.S. factories if they land high-speed contracts. "Unfortunately, it's been politicized in the U.S."
That's putting it mildly. Just about everything in the Obama era has been politicized, especially the contents of the stimulus. But high-speed rail has endured an inordinate share of high-profile attacks, even though construction has only begun in a handful of states. The new GOP governors of Wisconsin and Ohio recently shut down projects they had denounced as boondoggles on the campaign trail, forcing the Administration to redistribute their money. In Florida, which has received $2.4 billion to build the nation's first real bullet route between Tampa and Orlando, Governor Rick Scott has sent ominous signals that he might cancel that showcase project as well; at a Tea Party rally on Monday, he asked whether anyone actually intended to ride the train. No hands were raised. Meanwhile, negotiations with freight railroads have delayed efforts to upgrade Amtrak routes in North Carolina, Virginia and Washington. And the nation's most ambitious and important project, a bullet train between Los Angeles and San Francisco, has been a political nightmare. Its problems include well-financed local opposition, questionable ridership studies and cost estimates, and complaints that its first planned segment in the sparsely populated Central Valley would be a train to nowhere. Mica represents Orlando, but he has argued that the Obama Administration should focus instead on upgrading Acela service in the Northeast Corridor, which got almost none of the high-speed money. He's supported true high-speed rail on dedicated tracks, but he's mocked grants to increase speeds on much slower Amtrak routes that share tracks with plodding freight trains. And like many Republicans, he really hates Amtrak, the government's passenger-train operator, which has a role in almost every project. Mica and the House Railroads Subcommittee chairman, Bill Shuster of Pennsylvania, already planned to investigate the Administration's previous funding decisions  and they're not happy with this one. "The definition of insanity is doing the same thing over and over again expecting a different result, and that is exactly what Vice President Biden offered today," Shuster said. "If the Obama Administration is serious about high-speed rail, they should stop throwing money at projects in the same failed manner." In fact, after the initial $8 billion down payment in the stimulus, Obama had seemed a bit reluctant to throw more money at high-speed rail. A true national network of 200-m.p.h. bullet trains would cost hundreds of billions of dollars, but Obama requested only $1 billion for 2010. Irritated congressional Democrats gave him $2.5 billion, grumbling that he didn't seem serious. When Republican appropriators threatened to rescind all unspent rail money after the November elections, some train supporters feared that Obama would fold. Instead, after slow-playing his hand for two years, he's raising the stakes. In Philadelphia, Transportation Secretary Ray LaHood predicted that Obama and Biden would be remembered for high-speed rail the way Dwight Eisenhower is for the interstate highways and Lincoln is for the transcontinental railroad. "They will go down in history as the railmen of the 21st century," LaHood said. Unless the program goes down first. Next week, Obama will roll out his budget. Moments later, House Republicans will declare it dead on arrival. And after months of clamoring for major spending cuts, they're especially unlikely to accept increases to a signature Obama program. But the Administration still believes that public works can be powerful politics, that Americans want to think of themselves as builders, that investments can get respect even when spending is toxic. As Philadelphia Mayor Michael Nutter said in his introduction, "We're talking about jobs!" Unlike health care reform or Wall Street reform, high-speed rail doesn't have an obvious adversary in the business world; in fact, at a conference in Washington, D.C., on Tuesday, the U.S. High Speed Rail Association was mobilizing industry support for the $53 billion expansion. "This is a huge industry, and I think you'll see a lot more advocacy in the coming year," Alstom's Wochele said in a phone interview from the conference. "There's so much misperception about passenger rail. It's become us against them, and it shouldn't be. We need to make sure people talk to their Congressmen."